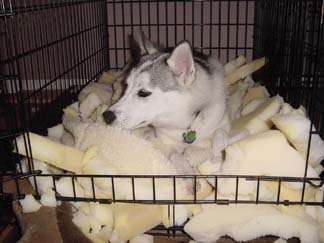 Siberian Huskies are extremely intelligent and stubborn. If you keep the mentality that you now own a very furry 2 year old child, you are half way there! Some Siberians will stare blankly at you when a command is given to them, even though they have done it perfectly when you’ve asked before. This is because they are thinking, "Well heck, I just did it 5 times why do I have to prove to you I know these commands? Maybe if a yummy treat is offered I will consider doing it for a 6th time." They also might "talk back", basically asking "Why?". If you sometimes find yourself talking to your Sibe trying to get them to do what you have asked them, prepare for a lengthy conversation, and like a 2 year old, the answer to each of your questions is always "Why?". Siberian's, with their independent nature, sometimes are thought to be "stupid" or "hard to train". This is NOT true. As with a 2-year-old child, they require consistency, patience and praise. As a Siberian owner, be ready to train, but also limit your training time. If you dwell on one command too long you may lose your Siberian's attention as they get bored sometimes doing the same thing over and over. If you see your Siberian's attention starting to leave you, you may want to end your training session and continue later. Try to limit your sessions to 10 minute intervals as this helps keep the dog’s attention on you. Any longer and your Sibe may lose interest. You will also need a sense of humor, as sometimes Siberian's can be frustrating to the new Siberian owner, especially when they did the command so beautifully yesterday and now, today, in front of company, all you get is the blank stare. To make training your Siberian Husky a success you need to use positive reinforcement training. "What is positive reinforcement training?" you may ask. This is a training method by which your dog is praised for performing the desired task or behavior. There are several ways this praise is given. It can be by voice, clicker, or treat. Positive reinforcement training is the best method to use when training your Siberian. As a working dog, they love to learn new things and enjoy having a job to do. When the dog is happily learning something new, and the owner is happy to be successfully teaching the command or behavior, it becomes a positive experience for all concerned and an excellent way to bond with your Siberian. As stated earlier, it is important to be consistent and patient. Remember, training for your Siberian should be done for no more than 10 minutes at a time, as your dog may become bored. If you want to devote 30 minutes a day to training, you will see much more improvement from three 10 minute sessions than one 30 minute session. Siberians are highly intelligent dogs, and as such, can become easily bored during training. Because of their high intelligence it is recommended to continually teach them new things throughout their lives, even if it’s as basic as catching a treat from a distance or touching your hand on command. But all training and no play makes for a REALLY hyper Siberian. Please remember your Siberian needs a break from "work" as much as you do, so playtime is an excellent outlet for your Siberian’s energy and also keeps them from becoming bored and destructive. "Idle paws are the devils playground". As you can see below some of our Sibes got bored...and destructive! This boredom destructiveness can be curbed by several things - - another dog to play with, crating when alone at home and not keeping yummy antiques at chewing level..LOL. But fret not, as your Siberian learns new things, you will see the bond between you and your Sibe grow and blossom. "Little Minka was so bored in her crate, she decided to play hamster!" 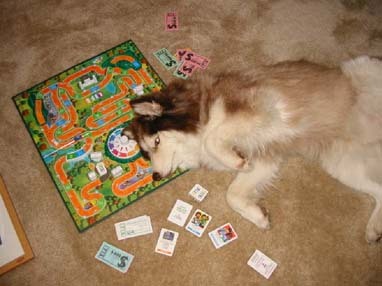 "In Spirit's spare time he like to play the board game "Life", and he always wins!"